In a two-center, comparative trial, 344 adults were randomly assigned to receive a single dose of inactivated split-virion (Imovax Gripeâ) or sub-unit (Agrippal S1â) influenza vaccine (1999-2000 formulations). For analysis, study groups were subdivided into adult (18-60 years old) and elderly (over 60 years) subjects. Blood was drawn immediately before and one month after vaccination, safety was evaluated using a blind-observer design based on reporting of solicited and unsolicited adverse events. Both vaccines were very well tolerated, had similar reactogenicity profiles, and elicited fewer reports of reactions in elderly individuals. Post-vaccination Imovax Gripeâ induced seroprotective antibody titers against the three vaccine strains in 94-99% of adults and 88-97% of elderly subjects, compared with 88-100% and 88-98%, respectively, of those given Agrippal S1â. In conclusion, the split-virion and sub-unit influenza vaccines had similar safety and reactogenicity profiles, and elicited satisfactory immunity in adult and elderly subjects. However, higher post-vaccination geometric mean titer (GMT) values in response to the B strain were seen with the split vaccine Imovax Gripeâ, giving it a better overall immunogenicity. Key words: Influenza vaccine; Split; Sub-unit; Adults. En un ensayo comparativo realizado en dos centros, se asignaron de manera aleatoria 344 adultos para recibir una dosis de vacuna contra la gripe de virus fraccionado inactivado (Imovax Gripeâ) o de vacuna de subunidades (Agrippal S1â) (formulaciones 1999-2000). Para el análisis, los grupos estudiados fueron subdivididos en adultos (18-60 años) y ancianos (más de 60 años). La sangre fue extraída justo antes y un mes después de la vacunación. La inocuidad fue evaluada utilizando un informe sobre reacciones adversas, usando un diseño de observador a ciegas. Ambas vacunas fueron muy bien toleradas, con perfiles de reactogenicidad similares y desarrollaron escasas reacciones adversas en los individuos ancianos. La vacunación con la Imovax Gripeâ indujo títulos de anticuerpos protectores en suero contra las tres cepas de virus de la vacuna en 94-99% de los adultos y en 88-97% de los sujetos ancianos, comparado con 88-100% y 88-98%, respectivamente, con respecto a los que recibieron Agrippal S1â. En conclusión: Las vacunas contra la gripe de tipo virus fraccionado y sub-unidad presentan perfiles de inocuidad y reactogenicidad similares, y desarrollan una inmunidad satisfactoria en sujetos adultos y en ancianos. Sin embargo, luego de la vacunación, se observaron valores de medias geométricas de los títulos ("GMT") contra la cepa B superiores con la vacuna de virus fraccionado inactivado Imovax Gripeâ, dando una mejor inmunogenicidad global. Palabras clave: Vacuna. Gripe; Virus fraccionados; Subunidades; Adultos. Influenza is an illness of viral origin characterized by a sudden onset of an acute fever, myalgia, sore throat, cough and rhinitis, which spreads rapidly throughout communities causing epidemics. Annual influenza attack rates average 10-20% of the worldwide population, but are higher in epidemic years1. As well as the high social costs of influenza (absenteeism, family disruption, care, etc. ), in some cases influenza can lead to secondary bacterial pneumonia or viral pneumonia and can exacerbate underlying medical conditions, ultimately with fatal consequences. In the USA population as a whole, a total of 20 000-40.000 influenza-associated deaths per year have been reported2. All age groups are affected but the elderly are particularly at risk, most influenza-related deaths and severe complications occurring in this age group3. In the USA influenza-associated hospitalization rates are 40-60 per 100.000 in the 15-44 year age group, 20-40 among 4564 year-olds increasing to 80-400 for those with high-risk medical conditions in this age group, and 200- >1000 for those of 65 years or older4. Up to now, most estimates of the excess morbidity and mortality attributable to influenza have come from North America and Europe because of the well-estab-lished surveillance programs in those countries. The importance of influenza in countries with less temperate climates, such as Colombia has only recently become appreciated5. Effective influenza vaccination programs require extended surveillance, and at the present time there is a growing network of National Influenza Centers operating in major cities of South America6. In Colombia, after an influenza epidemic in 1996 that affected approximately 6 million people and caused at least 600 deaths, a respiratory infection surveillance system was begun. Of the samples evaluated between March 1997 and June 2000, Influenza A was characterized in 12% and influenza B in 0.6%7. Vaccination is the primary means of protection against illness caused by influenza and is recommended for elderly persons, the immunocompromised and for those who are especially exposed (large gatherings, public transport, etc.) or liable to transmit influenza to an circle of high-risk acquaintances (in residential care, healthcare workers, etc. )4, 8. Three types of inactivated vaccines are used world-wide to protect against influenza: whole-virion vaccines, split-virion vaccines containing the external and internal components of the virus, and sub-unit vaccines composed of just the external components of the virus (haemagglutinin and neuraminidase)9. It has been proposed that the higher purity of sub-unit vaccines should make them less reactogenic and better tolerated. Conversely, the whole-virion and split-virion vaccines potentially contain more epitopes and so may be more immunogenic. In Colombia two influenza vaccines with proven safety and efficacy, a Triton X-100-split-virion vaccine, Imovax Gripeâ (Aventis Pasteur, France)10, and a sub-unit vaccine, Agrippal S1â (Biocine, Italy) are widely-used. As there is little comparative data available to select between such vaccines in South America, especially in the elderly, we performed a randomized study to compare the immunogenicity and clinical safety of these two vaccines in two groups of Colombian subjects: adults, i.e. aged from 18 to 60 years, and the elderly, i.e. aged over 60 years. The study was conducted in two centers in Bogota, Colombia during November through December, 1999. The protocol was approved by the Ethics Committee of Bogota for center 1 (Centro Médico los Andes) and by the Asociación Colombiana de Infectología for center 2 (SIPLAS LTDA). The trial was conducted in accordance with the Declaration of Helsinki Good Clinical Practice, International Conference on Harmonization Guidelines11 and national and local requirements regarding ethical committee review and informed consent, applicable at the initiation of the study. All subjects gave written informed consent prior to study entry. A blind-observer design was used for collection of safety data, and serology assays were performed without knowledge of the vaccine received. Intended subjects were adults aged at least 18 years old, whose health status was compatible with vaccination. Subjects were not enrolled if they met any of the following exclusion criteria: allergy to one of the vaccine components, acute febrile illness (oral temperature > 38°C) in the 72 hours preceding inclusion, aggravation of existing, severe, chronic illness (heart disease, respiratory disease, etc. ), prior immunization with 1999-2000 influenza strains vaccine or any other vaccination during the 4 weeks preceding inclusion or planned to be received between visit 1 and visit 2, auto-immune disorders, immunocompromised, on immunosuppressive therapy, immunoglobulins in the 3 months preceding inclusion, treatment with pituitary hormone extract, women of childbearing age who were not under effective contraception or who were at risk of becoming pregnant. Subjects were randomly assigned to receive a single dose of one of the two study vaccines, the randomization being stratified according to the two defined age groups (adult: 18 to 60 years, and elderly: over 60 years). The influenza vaccines investigated in this study are both propagated in embryonated chicken eggs and inactivated with formaldehyde. The Triton-split influenza vaccine (Imovax Gripeâ, Aventis Pasteur, Lyon, France) and the subunit vaccine (Agrippal S1â, Biocine, Italy) contained in each 0.5 mL dose, 15 µg haemagglutinin from each of 3 strains recommended for the 1999/2000 formulations12: A/Sydney/5/97 (H3N2)-like strain (A/Sydney/5/97  RESVIR 13 haemagglutinin), A/Beijing/262/95 (H1N1)-like strain (A/Beijing/262/95  X127), and B/Beijing/184/93-like strain (B/Yamanashi/166/98). The vaccines also contained thiomersal (< 0.05 mg) and formaldehyde (< 30µg), and were presented in a buffered saline solution (up to 0.5 mL). Each subject received a single intramuscular injection of vaccine in the deltoid, administered by a study nurse to ensure that neither the subject nor the study investigators were aware of the nature of the vaccine administered (blind observer design). A minimum of 10 mL of blood was collected for immunogenicity analyses immediately prior to vaccination and 30 days (27 to 33 days permitted in protocol) after vaccination. Serum concentrations of anti-haemagglutinin (HA) antibodies were measured using the reference technique of haemagglutination inhibition13 at the WHO Reference Centre Laboratory, Claude Bernard University, Lyon, France. Titers were expressed as an inverse of dilution. The humoral response to the three vaccine viral strains was assessed for each of the two vaccines, based on geometric mean titer (GMT) of anti-HA antibodies (with 95% confidence intervals), geometric means of post/pre-vaccination antibody titer ratio (GMTR), seroprotection rate (percentage of subjects with a titer > 40 on day 30), seroconversion rate (percentage of subjects with a pre-vaccination titer < 10 and a titer > 40 on day 30), and significant increase (pre-vaccination titer > 10 and at least a four-fold rise on day 30). Each subject was observed for 30 minutes for the appearance of any immediate reaction to vaccination. The subject was then provided with a diary card to record the date of onset, date of resolution and severity of any solicited (Table 4) or non-solicited local or systemic event occurring during the 30 day period between the vaccination and follow-up visits. The primary objective of the study was to compare the immunogenicity of the two vaccines in terms of post-vaccination anti-HA GMT values 30 days after vaccination. An analysis of variance (ANOVA) was conducted for each vaccine viral strain. The log10 of the post-vaccination titers was the dependent variable and the independent variables were vaccine group (2 classes: Imovax Gripeâ and Agrippal S1â), age (2 classes: adults, i.e. aged between 18 and 60 years, and elderly, i.e. over 60 years old) and vaccine group by age interaction as independent factors. Based on the estimation of the maximal standard deviation of the three vaccine viral strains (0.80) and a clinically acceptable difference between GMT values (0.301 in log10), a minimal sample size of 153 subjects per group was determined necessary in order to carry out 3 independent t-tests with an individual a type-I error of 1.6% and a power of 80%. If one vaccine showed a superior immunogenicity for at least one of the vaccine viral strains, it would be considered globally superior to the comparator, unless both vaccines showed superiority for a strain, thus allowing only a conclusion by strain. Immunogenicity analyses were performed in all subjects who complied with the protocol for the duration of the study and had data for the two blood draws, but safety was analyzed in a descriptive fashion in all subjects who received a vaccine dose. A total of 344 subjects were enrolled in the study. Imovax Gripeâ was administered to 172 subjects (83 adults and 89 elderly); 172 subjects received Agrippalâ (87 adults and 85 elderly) (Table 1). There were 43 subjects (19 vaccinated with Imovax Gripeâ and 24 vaccinated with Agrippal S1â) who were excluded from the per protocol analysis of immunogenicity for protocol violations, almost all due to missing blood samples or serology at one of the two visits. All subjects were included in the immediate safety analysis and safety data at the follow-up visit were available for 331 (166 in the Imovax Gripeâ group and 165 in the Agrippal S1â group). Demographic characteristics (male/female ratios of subjects and mean age) of the two groups were comparable (Table 1) for all analyses. Analysis of the pre-vaccination blood samples revealed that most subjects had elevated antibody titers for viral strain A/H3N2 (A/Sydney/5/97), 59.1% having seroprotective levels against this strain before receiving vaccine (Figure 1). Anti-HA titers were lower for the other two strains, 9.3% being seroprotected against A/H1N1 (A/Beijing/262/95) and 34.6% against B/Yamanashi/166/98. The distribution of anti-HA antibody titers for all three strains was similar in the two vaccine groups (Table 2). One month after vaccination, substantial increases in serum anti-HA levels were observed in all vaccine groups. Although there were no significant differences between the two vaccines with regard to post-vaccination GMTs for strains A/Sydney/5/97 and A/Beijing/262/95 (p = 0.271 and p = 0.716, respectively), Imovax Gripeâ elicited signicaficantly higher post-vaccination GMTs for strain B/Yamanashi/166/98 than Agrippal S1â in both the adult and elderly age groups (p < 0.0001) (Table 2). Therefore, according to the pre-established global statistical hypothesis set up in this study, Imovax Gripeâ had the best overall immunogenicity of the two vaccines. Despite this difference, satisfactory immune responses were obtained with both Imovax Gripeâ and Agrippal S1â. One month after vaccination, at least 94-99% (range given for the three strains) of the subjects in the 18-60 year age group who received Imovax Gripeâ had seroprotective antibody titers compared with 88-100% in the Agrippal S1â group. 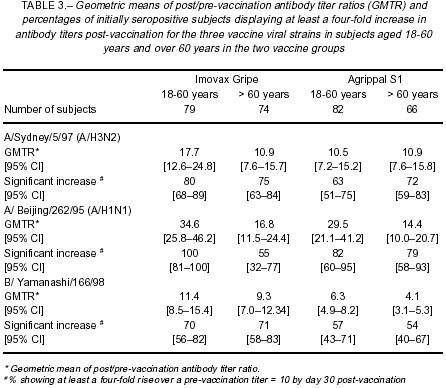 Although the proportional increases were not so great as in the younger adults, as shown by the GMTR values in Table 3, the elderly subjects had strong responses to vaccination, achieving seroprotective antibody titers in 88-97% of the subjects aged over 60 years who received Imovax Gripeâ and 88-98% in the Agrippal S1â group (Figure 1). 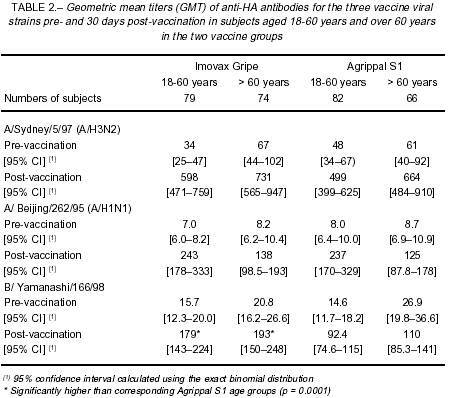 The percentages of initially seropositive subjects who achieved a significant increase in anti-HA antibodies tended to be higher in subjects who received Imovax Gripeâ for both age groups (Table 3). Initially seronegative subjects also displayed good responses. In the 18-60 year age groups, seroconversion rates were 93% and 100% for H3N2, 92% and 88% for H1N1, and 92% and 75% for B viral strains, with Imovax Gripâ and Agrippal S1â, respectively. The rates in the elderly subjects were essentially the same although there was a consistent trend for them to be slightly lower; 86% and 88% for H3N2, 86% and 81% for H1N1, and 89% and 67% for B, respectively. The reactogenicity profiles for the two vaccines in the descriptive analysis were sufficiently similar with regard to the frequency of solicited events reported, that it would be unlikely that any significant differences would have been found (Table 4). Reactions were mostly of mild to moderate intensity, and the majority occurred and resolved within 5 days following vaccination. Only one immediate reaction was reported: one subject vaccinated with Agrippal S1â experienced increased sweating and hypotension within the 30 minutes of vaccination. 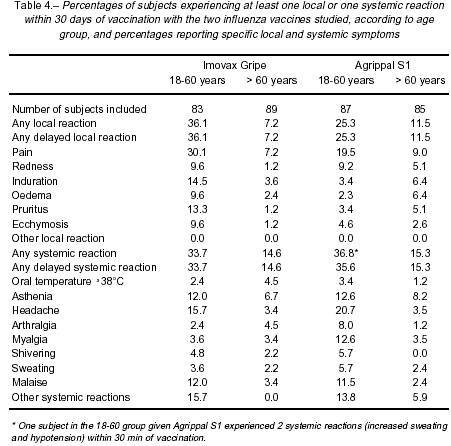 In the 18­60 age group, 36.1% and 25.3% of the subjects who received Imovax Gripeâ and Agrippal S1â, respectively, experienced local reactions (Table 4). Local reactions were less frequent in the older age group, with 7.2% and 11.5% of subjects who received Imovax Gripeâ and Agrippal S1â experiencing at least one local reaction in the 30 days after vaccination, respectively. Delayed systemic reactions were reported by 33.7% and 35.6% of subjects in the 18­60 age group injected with Imovax Gripeâ and Agrippal S1â, respectively (Table 4). Again the reaction rate was lower in the elderly subjects, with 14.6% and 15.3% reporting a systemic reaction. Regardless of vaccine group and the age category, the most frequently reported local reaction was pain and the most frequently reported systemic reactions were headache, asthenia and malaise. One serious adverse event was reported during this study. A diabetic female subject, 71 years of age, was hospitalized for bronchospasm approximately one month after receiving Agrippal S1â. The subject recovered with treatment and was discharged. This event was judged as unrelated to vaccination by the investigator. On a global perspective, influenza vaccination is re-commended in many countries worldwide including Western Europe, the United States, Canada, Australia, New Zealand, Korea, Japan, Singapore, Central Europe and Latin American countries. Most of these countries recommend vaccination to anyone six months of age or older who is at increased risk for complications of influenza and those who are in close contact with the at-risk population4, 5. In the United States, the Advisory Committee on Immunization Practices (ACIP) issued the recommendation in 2000 to include vaccination of all persons aged 50 and over4. This represents a lowering of the initial recommended target group age of 65 years or older since it had been noted that a substantial proportion (24-32%) of people between 50 and 64 years of age have one or more chronic medical conditions that place them at high risk for influenza-related hospitalization and death. Both vaccines investigated in this study have been available for over a decade, the split virus Imovax Gripeâ since 1968, and subunit Agrippal S1â since 1987, and both have proved to be efficacious in preventing influenza or in lessening the severity of the illness. The relative merits of each type of vaccine are the subject of much debate. Essentially, the subunit vaccines are promoted on the basis of a more "purified" product being less reactogenic, while supporters of inactivated split vaccines suggest that the wider range of epitopes available make such vaccines more immunogenic. However, there is little published information on the immunogenicity of these vaccines assessed in direct comparative studies in a given flu season, particularly in the important target population of elderly adults. Furthermore, prior to 1995 Imovax Gripe was prepared using a "Tween-ether" disruptive agent for the splitting, before this agent was replaced with Triton X-100 in order to improve industrial safety10. Thus data from studies published up to 1995 represents the vaccine prepared using the "old" process. Since it is widely believed that the elderly have a diminished ability to produce antibodies in sufficient quantity after vaccination14, we investigated the safety and immunogenicity of the vaccines in two age groups: adults from 18 to 60 years of age, and those aged over 60 years. In our study, we found high pre-vaccination antibody titers for the A/H3N2 and the B/Yamanashi/166/98 strains in both vaccine groups, giving seroprotection rates of 52%-62% and 29%-47%, respectively, compared to a rate of 8-11% against the A/H1N1 strain. This is indicative of previous vaccination or previous infection, either of which were possible since these same strains were present in the recommended formulation for the 1998-1999 flu season the previous year. Nevertheless, substantial increases in GMTs from pre- to post-vaccination were observed for all strains in both groups (ranging from 4-fold to 35-fold for a given strain and vaccine), signifying that even in the presence of protective antibody titers, the vaccines elicited a strong booster-effect. 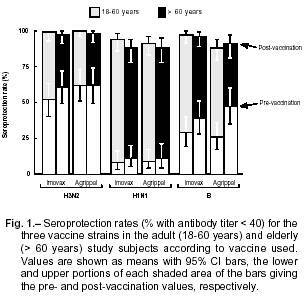 Over 92% of the initially seronegative subjects in the 18-60 age group achieved seroprotective titers after vaccination. Excellent responses were also observed in the elderly-over 85% seroconverting and 55-75% displaying a significant increase in antibody titers. These immunogenicity data correlate with the clinical results obtained with influenza vaccination in the elderly14-16. Conflicting results have been reported regarding the association of increased age and influenza vaccine response; however an in-depth review of relatively old literature (1968-1988) revealed that such an association has yet to be established17, and more recent studies have not found any statistical difference between age groups with regard to vaccine response18, 19. The vaccine has been shown to be effective in preventing secondary complications and reducing the risk for influenza-related hospitalization and death in elderly populations if the vaccine strain is similar to the epidemic strain19, 20. A meta-analysis and review of the literature (up to 1995) concluded that influenza immunization is an indispensable aspect of the care of the elderly21. Another meta-analysis based on the literature from 1975 to 1995 (and hence excluding the "new" Imovax Gripe) concluded that there was no effective difference in seroresponse to sub-unit or split vaccines in adults or the elderly22. Overall, because of the higher response against the B strain, the best immunogenicity in terms of post-vaccination GMT values was seen in response to the split vaccine Imovax Gripeâ, but both vaccines fulfilled the European requirements for influenza vaccines in the elderly13. These results are consistent with other studies that have reported an overall superior immunogenicity of split viral vaccines compared with subunit vaccines for at least one vaccine strain, although the differences were not always statistically significant22, 23. Despite claims that, in general, the safety profile of a subunit vaccine is superior to that of a split vaccine, the present study confirmed the safety and good tolerability of both types of influenza vaccine, which exhibited similar reactogenicity profiles. This result is similar to that observed in a recent evaluation of the safety of nine influenza vaccines in over 16 000 volunteers of 65 years of age or older in Italy, in which the reactogenicity of Vaxigripâ (equivalent to Imovax Gripeâ) was at least as good as the best subunit vaccine studied24. Injection site soreness was the most frequently reported adverse event following vaccination, as has been reported in other trials25-27. In our study local reactions were reported less frequently in the older age group for both vaccines. Similarly, systemic events were also reported twice as frequently in the younger age group. This same trend was confirmed in a similar clinical trial evaluating the 1999-2000 flu vaccine in which 34% of the subjects in the 18-60 years age group experienced local reactions and 23% experienced systemic reactions (Aventis Pasteur unpublished data). In the over 60 years age group, 21% experienced local and 3% experienced systemic reactions. A similar reactogenicity profile was observed with Vaxigripâ in French subjects from 8 to 85 years of age10. In a large-scale study of over 9 000 volunteers aged 65 and older influenza vaccination appeared very safe and well tolerated16. No serious adverse events were reported by any volunteer. Most reported adverse events were local injection site reactions that occurred in the first 2 days after vaccination; 81% of the reactions subsided within 3 days. Only 1.8% of the vaccinees reported fever. Local reactions considered disabling were rare (4%) and most subsided within 3 days. In terms of a risk-benefit analysis, the advantages of immunization against influenza more than compensates for the minor discomfort associated with vaccination. Influenza vaccination is associated with substantial clinical and economic benefits in adults of all ages including lower rates of hospitalization and reduced risk of death as well as cost savings28, 29. Moreover, vaccination is effective in preventing illness in all age groups3. Nevertheless, influenza vaccines are still underused in almost all countries. It is important that health care providers communicate the proven efficacy and low reactogenicity profile of these vaccines in order to increase public confidence and hopefully increase vaccination rates.